With the winter season beginning to bear down on us, we know that one of your biggest concerns is keeping your horses happy and healthy in the colder weather. We thought we’d check in with 13-time USEF Four-in-Hand National Champion Chester Weber to find out what his secrets are to keeping his team of horses show-ready in the winter months. 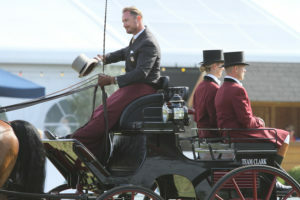 As you may already know, Chester, a Horse Quencher ambassador is arguably the most celebrated combined driver in the United States and has earned numerous accolades around the world as well. SBC: How does hydration play a vital role in horse health with your team? CW: Horses cannot perform to their fullest potential without proper hydration. Water is one of the first things horses give up when they need it the most. Horse Quencher plays a major role in keeping our horses healthy and fully hydrated to reach their maximum athletic potential, which is a winning investment for us. Winter tends to be a season of impaction colic, and when the water is very cold some horses will reduce the amount they drink. Horse Quencher gets the horses to drink even with very cold water. Horses will also reduce drinking water if they are sick and don’t feel like drinking, but staying fully hydrated is the best way to start the recovery process. Horse Quencher is vital in these cases because it helps them to start that process faster. 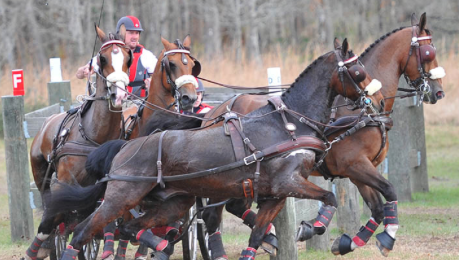 SBC: Can you describe how Horse Quencher has helped your team during travel and competitions? CW: Our team has a busy travel schedule and acclimating to new environments often causes horses to reduce or stop drinking. Since our team started using Horse Quencher, we don’t leave home without it, because it helps our horses to stay hydrated and ready for competition. 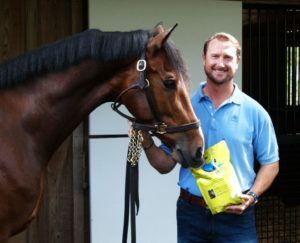 Horse Quencher is an all-natural product, rich with salt, that all of our horses like to drink. SBC: During the winter, what other crucial elements of horse care change? CW: When the winter season begins, we install heaters to keep our horses’ bodies warm before hooking up to the carriage or bathing. To keep their coats short at a summer length, our barn has lamps in each stall that operate with a timer during 5am-7am and 5pm-10pm. Horse’s hair grows differently depending on daylight hours, so this method keeps their coats’ short and prevents full body clippings. As you can see, even in Florida’s relatively warm winters there are some things that must change to accommodate the horses’ sensitive systems. One constant need that does not change is proper hydration, and to meet that need Team Weber chooses Horse Quencher. Ensuring your horse is well fed and hydrated on the drive is critical. Make sure he has access to water at every stop, which should be every 2-4 hours. If he is not good about drinking, try to encourage him by using a product like Horse Quencher in the water to add flavor with all-natural ingredients. Use slow-feeder hay-nets and travel with enough hay from your home barn to ensure a smooth 1-2 week transition at your new location. Pack a good first-aid kit. Bandaging, a headlamp, scissors, thermometer, wound treatments, medications like bute and banamine and anything else you would usually stock at home in the barn are a good idea. Bed your trailer appropriately. If you have an enclosed trailer, this can help reduce stress on their joints and feet. If you have an open or stock trailer, you may need to consider that dusty bedding may blow around during transport. Monitor vital signs carefully during transport. Catching signs of distress early can help you detect colic, for instance. Know what is a normal temperature, pulse, and respiratory rate for your horse before you travel. To follow Chester’s exciting competitions follow him on Facebook here, or Instagram here. Wherever your travels and competitions take you this winter season, don’t forget to pack your Horse Quencher. Here’s to hydrated, happy and healthy horses!